Review: Honestly, for a 100th anniversary issue, this could’ve and should’ve been a lot better. Made up of several short stories – and sadly not including one giant story that celebrates the event – each story is disparate from one another and and don’t seem to be connected by anything but that the same main character is featured in any of them. 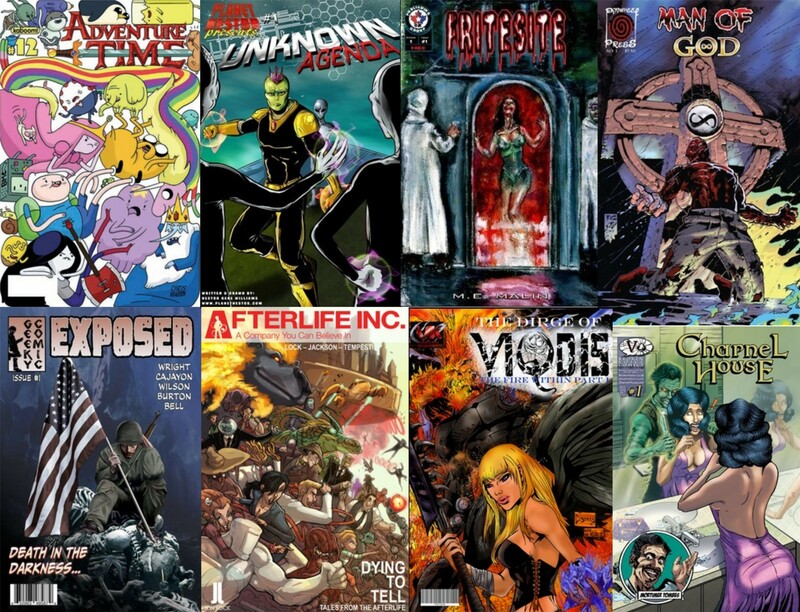 This causes some stories to be better than others, and unfortunately there are very few “good” stories in this issue. Some decent ones, and few that stood out, but mostly I just found this addition to Sonja’s saga to be rather boring and un-motivating. The first story, “The Snare,” by Trautmann, features a story where Sonja falls asleep and finds herself in a fever dream of nightmare where she battles a spider woman. The story itself is alright, but it’s nothing new. It’s a story trope that has been done to death, and there’s nothing new about it that stands out. The art by Acosta is the best part, but Sonja’s look bothers me. In the age she lives in, red “modern” booty shorts were not in fashion and yes I get that it’s better than a thong, but it just grates at me when I think they could’ve done something better. The next story, “Tresses,” by Roy Thomas isn’t actually too bad. It’s not stand out by any means, but it’s alright. In this story we get to see Sonja help a knight try not to be killed by a Rapunzel like creature, but fails. It was interesting to see her take his horse as well and not try to kill the creature. I like that Sonja realized she wouldn’t be able to kill the thing, but the fact that she left it so that others can still get caught in its snare is fascinating to me. It’s a character flaw that I like. “Stick and Stones” by Oeming was one of the few stand outs to me. In this one Sonja has been taken captive and she ends up teaming up with a young boy in order to bring down a giant bipedal boar warrior. The Boar is actually a wonderful character, and I kind of wish he could’ve been kept around more but alas was not the case. He was well read and logical, but also a big brute and I love when the most unlikely villains are like that. The kid was pretty cool too. “The Torch” by Simone was an interesting one, but I also thought of it as one of the weaker ones. I enjoyed meeting Amena, and I kind of wish she could’ve been used again somewhere, maybe she will someday, but funny enough my biggest gripe with it is how it ends. It’s a small thing, but for whatever reason it bugs me. The story centers around Sonja learning the history of Amena from the woman herself after she was ambushed and left for dead by some marauders. At the end she kills the marauders and gets her sword back, and then leaves the sword in Amena’s dead hands as she walks away. It shouldn’t bug me, but it does that Sonja went through all that trouble to get Amena’s sword back only to leave it with her lifeless body and doesn’t even bury her with it or at all. I get how symbolic it is, letting a warrior die with her weapon in hand, and for some religions it’s so that Amena would have protection going into the afterlife… that being said it doesn’t do her much good if someone comes along later, say that night or on another day and takes her sword and leaves her body. Sonja should’ve buried her, and that little thing that she didn’t do ruins the whole story for me and I wish it didn’t. The last story is “Three Wishes” by Lieberman. I like it as well, but sadly, like Simone’s story the ending ruins this story for me as well. I won’t go into as much detail on this like I did with her’s, but this story sees Sonja force a mad magician into granting her three wishes with the last wish being a secret until the final pages. I liked her forcefulness, and her dubiousness in destroying his power source after getting her 3 wishes, and I also found it touching that her last wish was to see her father one last time. Buuut, and I know this is just my own personal preference here, I wish the hype surrounding the final wish wasn’t ruined by the fact that that this isn’t a touching moment between father and daughter, and Sonja seems to be okay with this. He kind of gives her a mini lecture before returning to the great beyond and she just smiles and takes it. I get it, she loves her father that much, but if that were me I’d been upset had I revived the spirit of one of my parents for just a few moments and that’s all they said to me. I dunno, it’s just such a somber note to end on. It isn’t uplifting in my eyes, and I kind of wish that’s how the issue had ended. Overall this just wasn’t that great of a 100th issue, and that’s really sad. It has a lot to enjoy for some, but not for me. 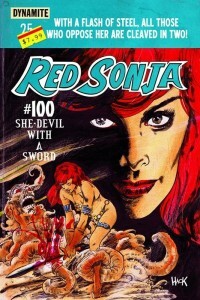 I really like Red Sonja, but this wouldn’t make me want to read the comic. Such big names, but such mediocre work. Oh well. Summary: To celebrate to the 100th issue of Red Sonja, the She-Devil with a Sword partakes in many adventures of swords and sorcery. From an existential night terror, to one last meeting with someone important to her, Sonja’s journey continues for better or for worse.